We have such a tremendous variety of produce in India thanks to the geographical an climatic diversity through the length and breadth of the country. And I am one of those mad people who collect such produce from wherever we travel. I often bring even fresh produce in my hand baggage but the suitcases are stuffed with varieties of rice, lentils and millets many a times. A few millet grains tumble out of one of my suitcases whenever I open it for the next travel, thanks to a torn packet once. But I am also lucky to get many of these produce at the India International Trade fair stalls here in Delhi. I make it a point to go to the state stalls and buy as much as I can carry. And I can carry a lot trust me. In the trade fair grounds you have to carry whatever you buy, a classic shop till you drop situation. The black and purple rice from North East I always get from there. I got many queries about rice varieties and their availability when I posted this picture last week on Facebook. Thankfully we have started getting these varieties in organic shops almost all around the country, sourcing them locally is the best bet though. The white rice in the picture is a short grain aromatic variety called Kala namak in eastern UP, the same rice is called Gobindbhog in Bengal and probably Ambe Mohar in Maharashtra. The top right is black rice, bottom right is purple rice and bottom left is red rice from Tamilnadu. The kerala red rice looks a bit different. Here I am sharing about the black and purple rice varieties from north east India. Both varieties are mostly available hand pounded as these are not industrially produced. The black variety is so rich in pigments that the taste is quite complex due to that. 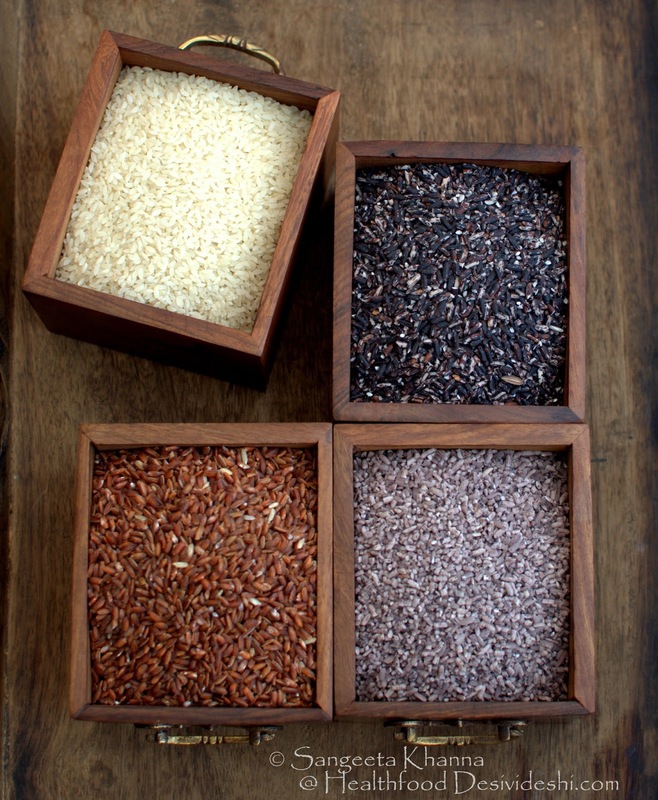 The concentration of anthocyanins in black rice is the highest found in food (higher than blueberries) and it is rich in essential amino acids too. This is how one of my pigment rich meals looks like. 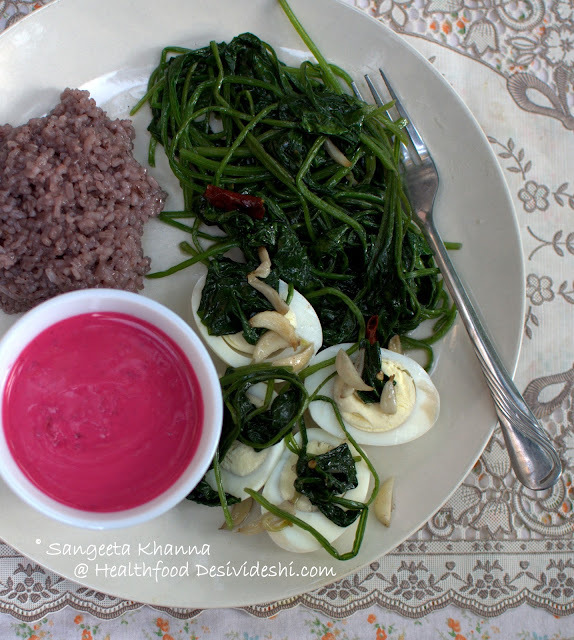 Here I have served the purple sticky rice with beetroot tzatziki, boiled eggs and sauteed spinach with garlic and chillies. Both beets and spinach were homegrown in this meal that I shot 2 years ago. Apart from such meals my favourite way of using these black and purple rice varieties is to make desserts with them. The rice gets nice and creamy when overcooked and combined really well with both milk (dairy) and coconut milk or cream. 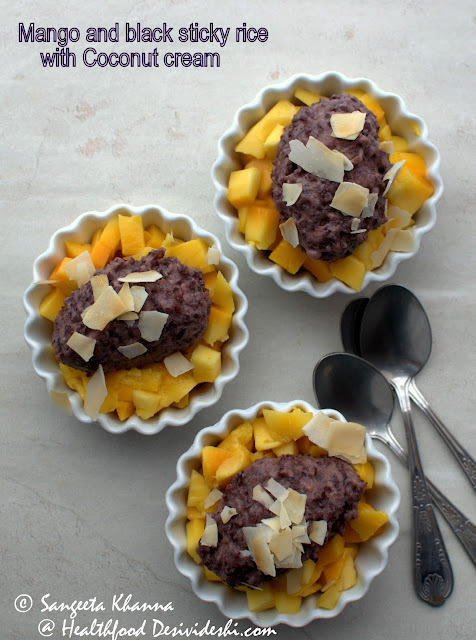 The black rice pudding made with coconut cream is the one I love the most. 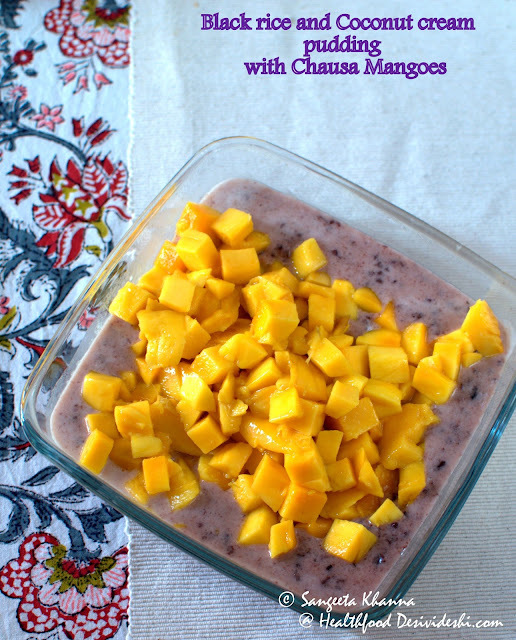 The rice lends a nutty and creamy flavour to the pudding that combines really well with mangoes. Sometimes I add just enough coconut cream to make a thick setting pudding and sometimes I add more coconut cream to make it creamier to coat the fruit cubes. 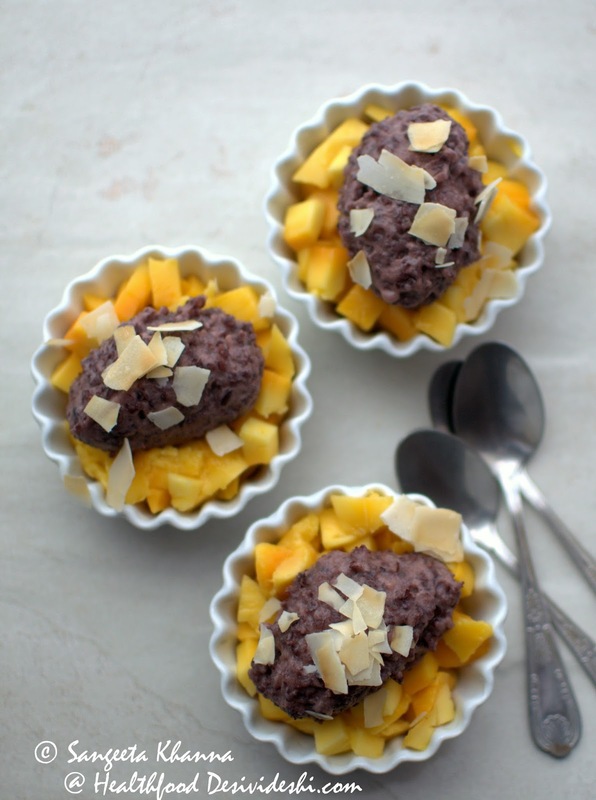 Here is how the well set black rice pudding looks like, over a bed of cubed mangoes and some toasted coconut chips. The creamier version looks like this. Moreish and indulgent, very delicious pudding that you can't resist. I make it without any added sugar and it has never disappointed me. The natural sweetness of the rice and coconut cream combines to make a heavenly dessert. 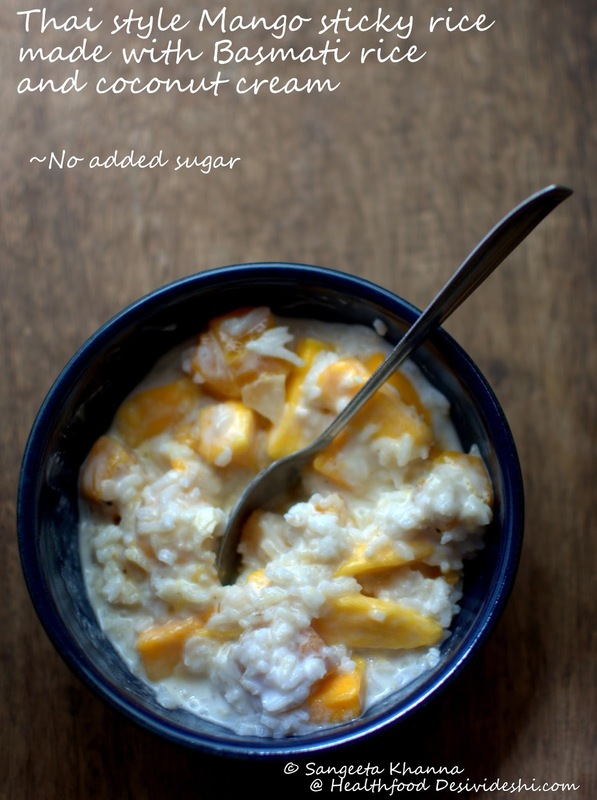 I even make this pudding with the white short grain rice pictured above, the inspiration of this dessert comes from Thai Mango sticky rice and I have been making several versions of it for so many years. Black or purple sticky rice just makes it so much more value for each calorie consumed. I wouldn't tell you how many times I made this dessert this season. I tried it with all the mango varieties we could lay our hands on and it tasted great with each one of them. This creamier version I served to my extended family when we all met this weekend and everyone loved it. I had made two more desserts and only one of them (rice kheer) had little sugar in it and my dad who is a diabetic lapped up the 'no added sugar desserts' happily. The basic recipe remains like this Thai sticky rice with mangoes, the black or purple rice need about 3 times water to raw rice and I prefer it overcooked. If you keep the rice grains just cooked you might feel a slightly bitter aftertaste which disappears once you overcook them. Once cooked, just stir in coconut cream (25%fat) and adjust thickness as you wish. For 1 cup cooked rice I usually add 200 ml coconut cream to get a set consistency (after refrigeration). For the creamier pudding I add 500 ml coconut cream to 1 cup cooked sticky rice and whisk well till uniformly mixed. No sugar is required to sweeten it but you can add if you wish, just take care to preserve the natural sweetness of the rice and coconut cream in this dessert, you wont like sugar to hit your palate first in this case. Try it without any sugar for the first time and see if you want it sweeter. 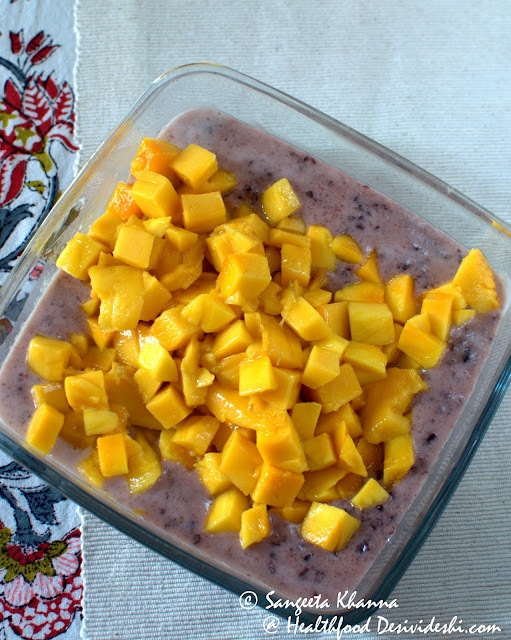 Trust me you wont feel like having any added sugar in this dessert. May be the mango to sticky rice proportion can change if you want it to be more fruity and that is quite good too. Thai sticky rice and mangoes gets a new lease with black sticky rice trust me.